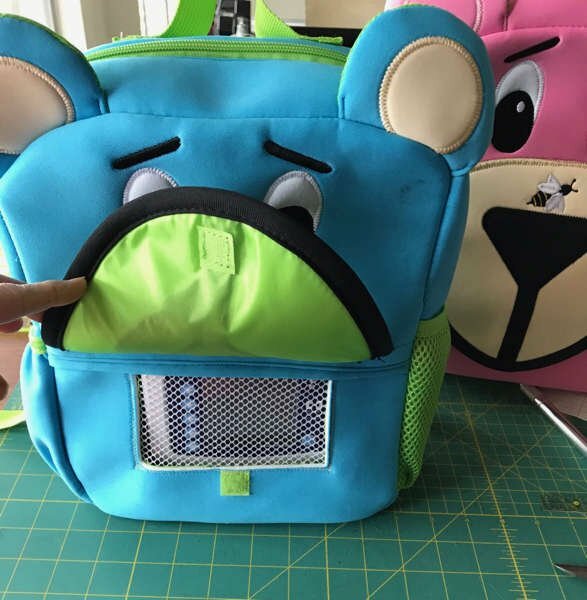 THIS Booski Bear looks just like ALL the other Booski Bear backpacks...but he's very different! He's been adapted and reconstructed for a "Tubie" child. Children who need feeding tubes (affectionately called "Tubies") need to have a way to carry their own food supply as they go about their day. This is always a challenge for busy, active families. I learned about "Tubies" while launching Animal Packers. We decided to attend a few consumer shows in Texas, so that we could learn more about our customers. 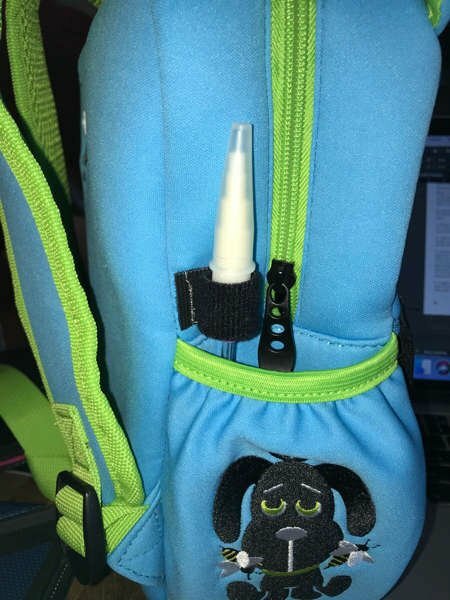 During those shows, I met a few parents who wanted to find an affordable, washable, lightweight backpack for their special "Tubie" kids. One Mom, Kindra, tugged at my heart with her passion for finding the BEST things for her son, MJ. (That's MJ in the photo above....isn't he a cutie?) Kindra helped me to understand the needs of both the child and the parent. She described what she thought was needed in a "Tubie" backpack and gave me a basic understanding of how the feeding systems worked. 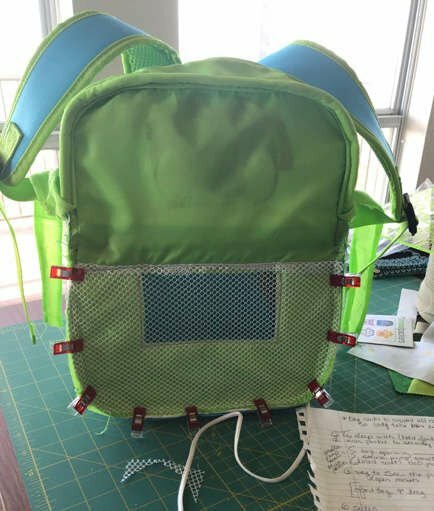 After my discussion with Kindra, I couldn't wait to get into my design studio and figure out how to make the backpack work for MJ! In order to correctly design the backpack, I needed some sample equipment. I wanted to use the same type of feeding equipment that families used for their "Tubie" kids. 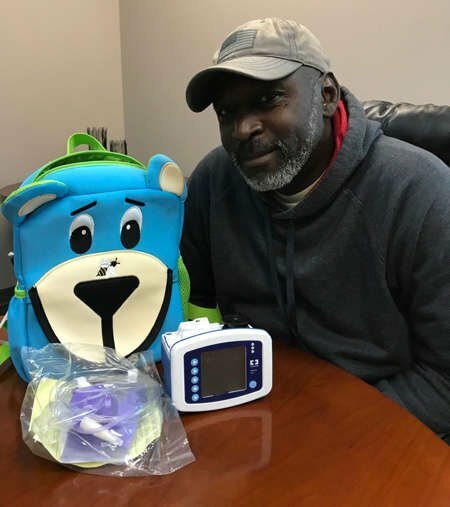 I called Travis Medical in Austin, Texas, and two wonderful people, Dee Ann and George (shown here), found some equipment that they could donate. The pump shown in the picture is one of the two main types of pumps used for children with feeding tubes. 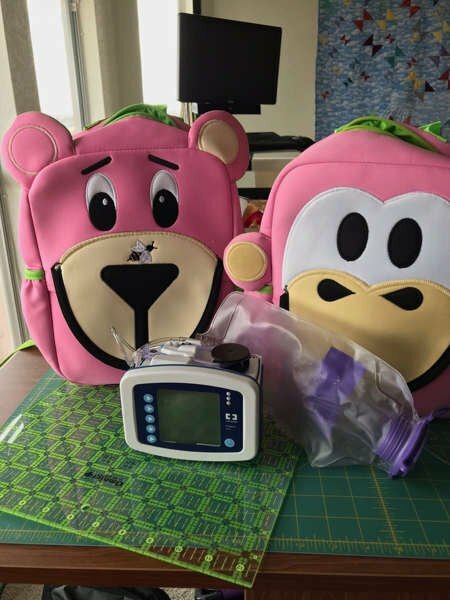 I'm working with the Booski Bear backpack design because his GIANT smile is ideal for concealing the "window" to the feeding pump. Kindra told me that parents need a fast way to check and monitor the feeding pump while the child is wearing it. She said that a window on the outside would make her life easier when out and about with MJ. I'm also going to see if Nay-Nay Monkey can be adapted. Her smile isn't as big as Booski's, but I'd really like to offer options in design. A simple lift of Booski's smile reveals easy access to the pump readings and controls. I'm experimenting with different types of window 'coverings.' I want to make sure the backpack is easily washable, just like ALL Animal Packers backpacks. As an engineer (AND a Mom & Nana), I can't imagine a better use of my skills. I'm excited to work on this project from a design perspective, but I'm more excited to offer families choices for their kiddos. The next goal is to offer our Adapted Backpacks at (about) the same price as our other backpacks. The first few adapted backpacks were made by me. Obviously, this is not sustainable, scalable or cost-effective. I could hire people in my community to adapt them, and I would LOVE to do that, but that will drive the cost of the backpack too high for "Tubie" families. If we assess that the need for our adapted backpacks is great enough, our plan is to go to our factory to make them. This will keep the cost much lower for "Tubie" families. How can YOU help??? Please help us learn more about the needs of "Tubie" kids and families. We welcome your comments and questions, ideas and encouragement!